The Coat of Arms of Carmel D.Ed. 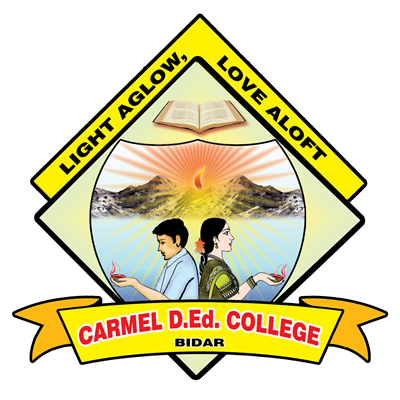 College, Bidar is ‘LIGHT AGLOW, LOVE ALOFT’. Carmel D.Ed. College at Haldikere, Bidar is the Teacher Training Institute for Elementary Education instituted by the Apostolic Carmel Educational Society, Karnataka (Reg.). Bidar District is known as the Crown of Karnataka being set at the topmost, namely, the tip of Karnataka State. The District is known as the backward area of the State and great efforts are on to bring it to the mainstream of development. The number of educational institutions in the area has gone up in recent times and there are quite a few English Medium Schools felt essential to build up the competencies for life and personality development of the coming generation. Even in the higher education front there has been some growth and in the past couple of years attempts have also being made to start the teacher training programme in the district in order to provide sufficient teachers to bring about this development among the students. The existing Teacher Education Institutions are mainly in the Regional Language, Kannada and it is a matter of pride that the district is growing in this direction of improving the quality of teacher education. However, there has been a great concern among the public that they have to get teachers from the neighbouring States to teach in the English medium schools in the absence of English Medium D.Ed. Colleges.